While not always the case, some of the best songwriters, filmmakers and artists (in my opinion) have a solid foundation in literature and writing—having the ability to clearly express thoughts and emotions, regardless of the medium. I think it is also true that one’s own work is improved by knowing limitations and collaborating with others. 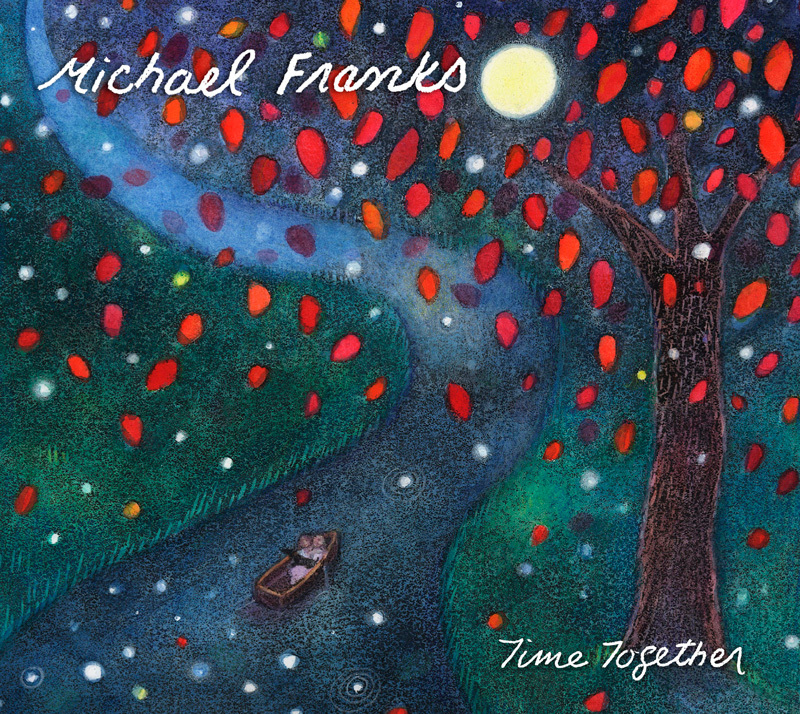 Michael Franks’ work is a prime example of this, being a writer of finely crafted songs that tell stories, many of which include a variety of arrangement techniques brilliantly suited to a given song. In his teen years in California he discovered poetry, picked up a guitar, and went on to study English at UCLA while learning independently about and listening to music: Brubeck, Getz, Gilberto, Jobim and Davis, among many others. For a time he wrote songs as a freelancer, and I learned only recently that his works appeared in films including Zandy’s Bride (starring Liv Ullmann and Gene Hackman). Others recorded his earlier songs and in 1973 he released an eponymous work (on Brut Records…my original copy long ago worn out) that was later reissued as “Previously Unavailable”. I first became familiar with Franks’ work after he had relocated from California to New York when a friend recommended that I purchase “Burchfield Nines” (released in 1978). From there I went back to his first three albums “Michael Franks”, “The Art of Tea” (known best for “Popsicle Toes”) and “Sleeping Gypsy”. In total, Franks has released seventeen separate studio albums and there have been a variety of reissues and compilations including a 1980 live album “Michael Franks with Crossfire Live”. Most of his work has been recorded with Warner/Reprise (1975 through 1995), one release on Windham Hill in 1999 “Barefoot On The Beach”, 2003’s “Watching The Snow” on Rhino (then Koch Records) and “Rendezvous in Rio” on Koch Records in 2006. Throughout his career, aside from Franks’ songwriting and singing (with his almost whispering mellow vocals), also of interest to me has been the variety of musicians, producers and arrangers he has collaborated with—a group of incredibly talented musicians and vocalists, too many to list here such as, Joe Sample, Larry Carlton, Wilton Felder, Astrud Gilberto, Peggy Lee, the Yellowjackets, the Brecker brothers, and producer/arrangers such as, Russell Ferrante, Jimmy Haslip, Matt Pierson, Jeff Lorber, Tommy LiPuma, John Simon, Rob Mounsey, Walter Becker, Chuck Loeb, Charles Blenzig, Mark Egan, and (my favorites) Gil Goldstein and Ben Sidran. And mysteriously deposited throughout his albums have been songs from a (perhaps forever…waiting patiently) forthcoming Broadway musical “Noa Noa” based on the life of artist Paul Gauguin who spent time in the 1890s in Tahiti and wrote a journal of the same name. Many contemporary artists of the same period appear in the songs, like Vincent Van Gogh. Franks’ work ranges from acoustic to electric Jazz contemporary vocals, some funk and fusion (like with Jeff Lorber) to work that skims the edges of pop vocals (“Your Secret’s Safe With Me” from the album “Skin Dive”). Much of his most successful work has skillful wordplay, innuendo and humor (like “When Sly Calls” from 1983’s “Passionfruit”), but his most haunting and beautiful are my favorites like his duet with Peggy Lee (one of her last recorded works) “You Were Meant For Me”, exquisitely arranged by Ben Sidran. With some minor exceptions, the album “Time Together” instantly became a favorite of mine this past summer. “Now That Summer’s Here” and “Summer In New York” setting an upbeat mood for a delightfully mellow summer, as Franks can do so well. Will we ever know if “One Day in St. Tropez” is fact or fiction?—a story of hitchhiking in France in 1963, narrator picked-up by Brigitte Bardot in a Jaguar XKE; the poetry and timing in this is light-hearted, romantic and the fantasy of it all, like a dream. “Mice” is a delightfully humorous statement on how perhaps the “lower” species can teach humanity about better behavior. For the first time (as far as I know), Franks dipped his toe into politics with “Charlie Chan in Egypt” reporting on the tragic state of affairs America found itself in as a result of recent military incursions. The album continues with other memories and romances of summers past as in “Samba Blue” and subtle advice on keeping things positive in “I’d Rather Be Happy Than Right”. Then the melancholy of summer, drawing to a close, as expressed in “If I Could Make September Stay”. My favorite of all 11 songs is the tender and loving tribute to the Franks family’s departed (rescue) dachshund Flora in the title track “Time Together” (Franks being a devoted animal lover and supporter of various animal rescue organizations). In this, Gil Goldstein’s arrangement is just stunning and a perfect complement to the lyrics and sentiments being expressed. This entry was posted on March 7, 2012 by wajobu. It was filed under Uncategorized and was tagged with AffordableAudio, Antonio Carlos Jobim, Astrud Gilberto, Audiokarma.org, Ben Sidran, Daily Audiophile, Gil Goldstein, Guitar, HifiZine, Instrumental, jazz, Michael Franks, Music, Passion Fruit, Peggy Lee, Popsicle Toes, Review, Rob Mounsey, Shanachie, Stan Getz, Vocal, Vocals. nice review! intense… dog. get it?